Axel Freed teaches Dostoyevsky at a New York City university as part of a literature course. It's no coincidence that Freed is familiar with the work of the author of "The Gambler," a novella about a compulsive gambler. Axel fits the bill, and James Toback's original screenplay echoes the themes set out in the Dostoyevsky classic existential tale. Freed's compulsion is explored with savvy style by director Karel Reisz. Axel Freed's gambling roller-coaster life takes a turn around the sharp end of the track as he goes in the hole for fifty "large." He's got to find a way to raise the money. Time's running out, and yet, as disaster lurks around the bend, Freed cannot contain his compulsive nature. Risk feeds his life. He wants to reach far beyond his natural needs. 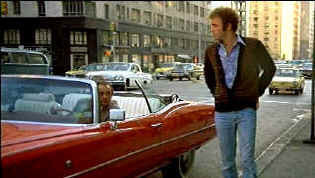 James Caan is can of edgy of energy as Freed. He's at once crude, intellectual, brash, and underneath the tin surface, fragile. An uncontrollable self-destructive force rages through Freed. This guy is is really is the edge of the precipice. I don't fully understand him; I don't think he fully understands himself, but the view into his life is a fascinating trip. Freed's a character painted in contrasts. He's extremely bright, extremely obnoxious, but can turn on the charm big time when it suits him. Win or lose, Freed is a lost soul. What will satisfy him? Maybe nothing but the ultimate. Freed is one sick puppy. We pop into his life at a moment of intense crisis, but you have to wonder how he made this far in life considering his gambling habits. Has it suddenly escalated? There's no indication that this is anything but the Freed norm. Nothing sets off the excess of risk-taking. The Gambler is aggressively cut by director Karel Reisz. He manages to get inside the head of Freed, illuminating the character insightfully. The gambling scenes are very well done. Reisz maximizes tension, captures the ambiance, and never lets up. Reisz captures the flavor of the New York settings very well. Even the apartment he chooses to shoot from provides some excellent visual opportunities lending authenticity to the work. Reisz wind up this coil of a movie as tightly as his main character. At any moment you expect The Gambler to explode. The tension is maintained by tight directorial control. There are many fine moments in the film. At the 80th birthday celebration for Axel's wealthy grandfather A.R. Lowenthal, Axel makes a speech about the patriarch that in fact may reveal a lot about Axel's desires. The scene at the swimming pool when Axel introduces his girl Billie to his grandfather is crafted with a straight-edged razor. The sudden turn of the grandfather is a master script stroke. Jerry Fielding's scoring is based on Mahler's First Symphony. It plays against the action like poker chips floating across the table in slow motion. It's creates an elegance to many of the scenes effectively raising the stakes. Supporting roles are filled by a full house of strong character actors, bringing even the smallest roles to life. A young James Woods plays a bank clerk, M. Emmett Walsh is a Vegas better, Burt Young an explosive enforcer, and then there is former blacklisted actor Morris Carnovsky parlaying the role of Axel's grandfather A.R. Lowenthal to scene-stealing proportions. Lauren Hutton is one great dish in The Gambler, the bloom of youth glowing on her like a delicate perfume. Paul Sorvino is outstanding as Hips, Axel's main book. The DVD transfer features very nice, deep, color saturation. Overall light output is good. There's a fairly large helping of grain in the image, but it's part and parcel of the shooting style and look of the film. The grain is handled in a consistently tight fashion. There is some fine detail artifact interaction that creates an excess of noise in the picture. Some of the interior scenes are very shadowy and the lighting appears too even with dark detail blending into one another. Some of the sound is slightly rough, especially in Hutton's big speech. Was it the best year ever for great films? Click on the bottle for more. Buddhacon features a wide range of reviews from DVDs, first-run movies to top-selling albums. Editorials, features and more. User comments appended. Check out their hot review of Spiderman with some interesting details.